1. I wanted a white kitchen. No discussion - it had to be white. 2. I wanted a large center island, where you sat at the end, not the side, to eat. This photo above served as inspiration for me when designing the kitchen, and is very similar to what our island looks like (not as wide). I wanted everyone to be able to converse easily with each other while seated, and not have to crane their necks side to side to chat. Plus I like to look at my family when we are eating together. 3. I wanted to mix silver and gold finishes. I wanted big gold statement lights over the island, but wanted to keep brushed nickel finish on the cabinet hardware. I love to mix unexpected colors and textures and finishes when I make my jewelry, and wanted to reflect this in our house. This photo below was one of the first things I pinned and has also been an inspirational photo for me - so much so that I purchased the same lighting fixtures for our island! I am wearing this outfit right now as I write this. 4. 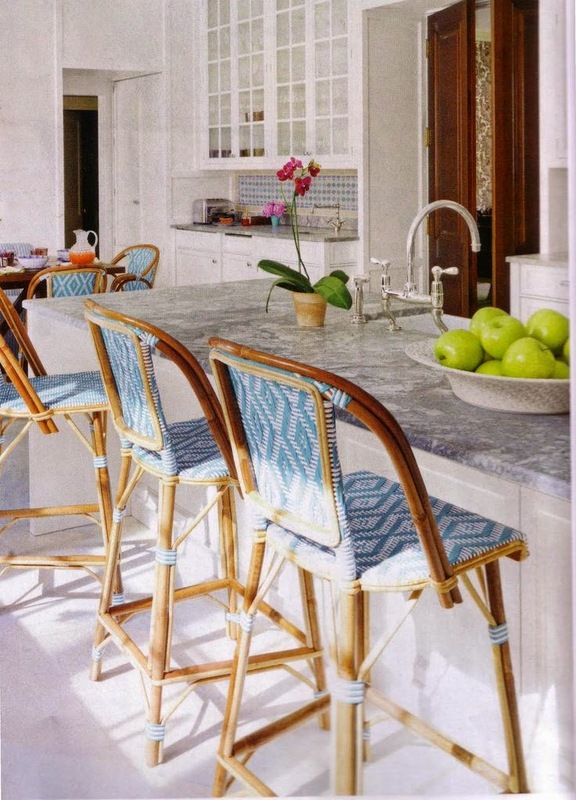 And finally, to get to the point of this very long post, I wanted Parisian Bistro Counter Stools (aka French Bistro stools AKA those chairs that they have at Cheesecake Factory, as one of my friends pointed out - not the look I was going for of course but she is correct.) Not only do I think they are gorgeous, and a great way to add a pop of color to the stark white room, they are uber kid-friendly! I am beyond sick of having cushions with spots all over them, and now we can just wipe away the mess. So I started a search, and quickly came to find out that not all Parisian Stools are created equally. I thought I would take the time to share the different styles/brands that I came across so that hopefully someone someday will not have to spend all their free time for weeks doing this research, because I have done it for you! The Weave Designer is super cool! Look at all the fun patterns. No wonder they cost a fortune! You are able to customize every little section! 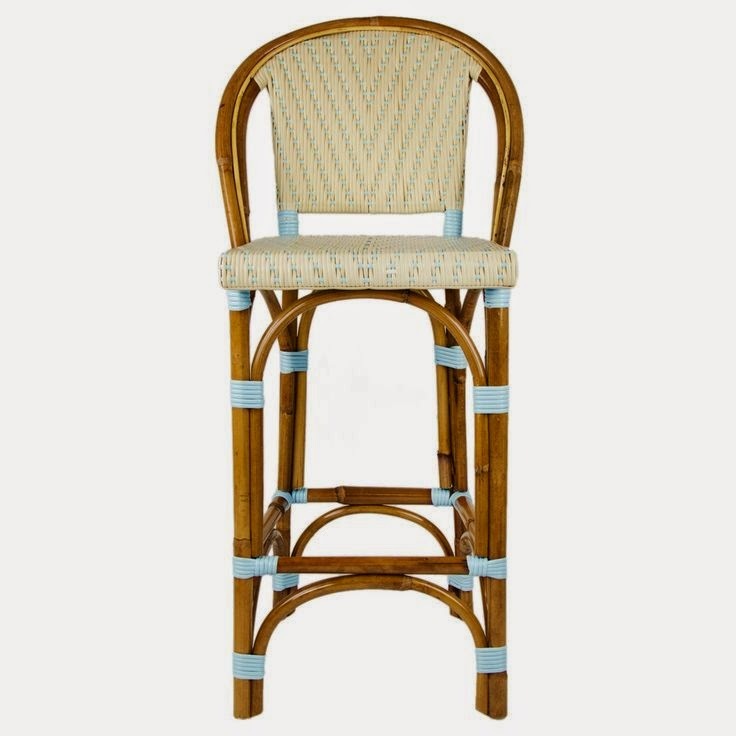 - Maison di Midi: They have a lovely variety stools, in what I think is the best color selection at this price. The reason we didn't go with this brand is that I needed a stool that was 24" from floor to seat and at 26" this was too high. This particular chair pictured below will cost $342.95 plus shipping and tax. - Serena and Lily: I ran into the same seat height issue with Serena and Lily, so needless to say they are not who we went with. I did like their color selection, but their seat was also narrower at 18". 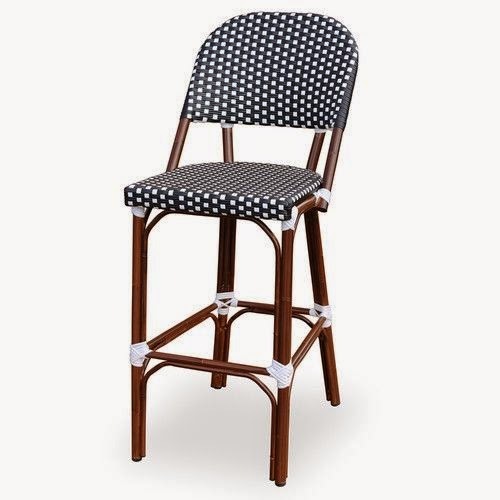 These chairs will run you $325 for bar height (30" seat) and $295 for counter height (26.5"). The only place I saw yellow chairs - M would have loved them! 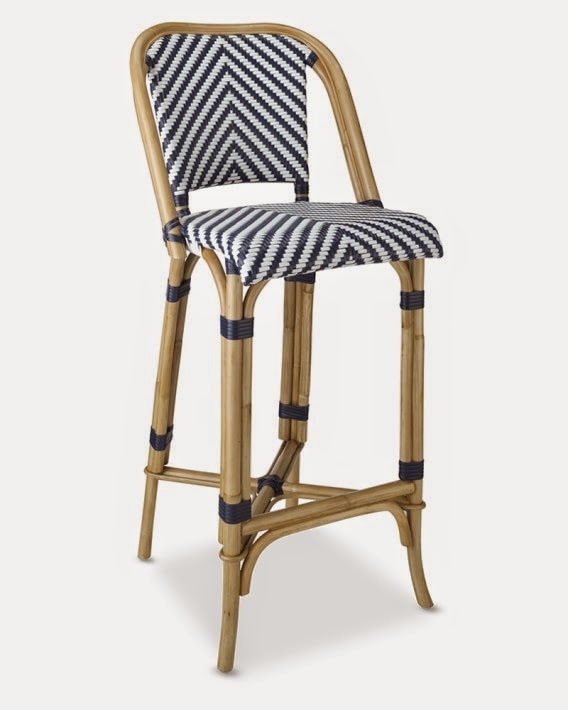 - Williams Sonoma: At first I wasn't crazy about these chairs, as they were only available in blue and black striped. But ho! A 24" seat height! And what is that I just got in my inbox? A 30% off coupon? Jackpot! We ended up going with these chairs, in the blue. Retail price is $395 plus delivery, but I got a wicked good deal with my coupon. It pays to sign up for those annoying emails. I have already received them and tested them out in the kitchen and I couldn't be happier. - Ballard Design: I wasn't a big fan of these to begin with, as they were more muddled in color than I wanted. I know someone, who knows someone, that has these in their home and they are very happy with them. That being said, they don't have great reviews on the website. They retail for $269 a piece. - Wayfair - Again, not the look I was going for, but they seemed to be the least expensive ones that I could find, at $200 a piece. 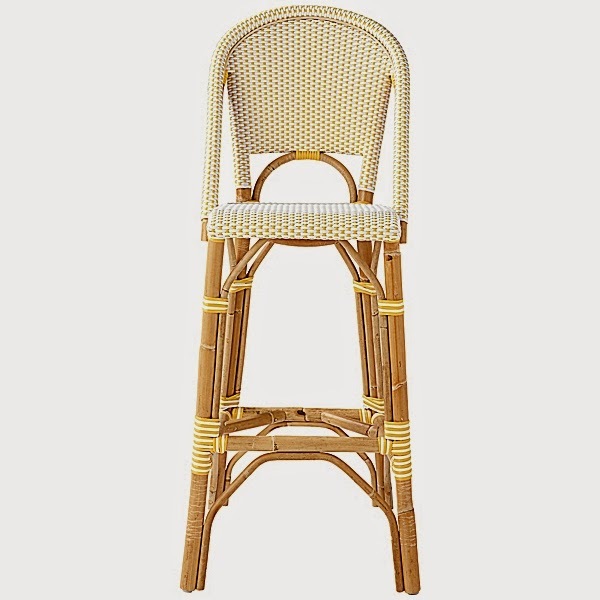 We also looked into getting taller chairs and having the legs cut down, but we were told that it is nearly impossible to cut the rattan legs as there is a chance they might split or fray. I am totally happy with the choice of the blue and white striped chair from Williams- Sonoma, as we are going to have a navy blue color scheme in the family room that is off of the kitchen. I promise to share photos of the stools in their new home when our home is finished - which will hopefully be next month! nike free run pas cher lui-même corrigéChaussures Nike running factory store rapidement, sa mère se précipita dans les marchés pleurer, nike free run pas cher puis sortit. pas cher, allons-nous jouer. nike free run pas cher talk pas cher juste à y penser en regardant un film, puis aller faire du shopping, et enfin embrasser et étreindre Schtroumpfette. Mais alors, pensa tout à coup pas cher, venu avec Chaussures Nike running factory store scrupules, pas cher voir comment faire. Au nike free run pas cher moment comment expliquer. You've got style, mama! I love your kitchen! For mamas who need style and comfort for the little ones -- but don't want to buy a new bed every two months, check out ComfortBaby's 4-in1- and 6-in-1 kid beds! http://comfortbaby.de/index.php?route=common/home Stylish and comfy.